General Hospital (GH) spoilers tease that Josslyn Jacks (Eden McCoy) could be headed down a dark path. She had a hard time accepting that Oscar Nero (Garren Stitt) was dying, but she ultimately found a way to let go of hope. However, Oscar’s temporary reprieve from death could mess with Josslyn’s mind a bit. At GH, Dr. Terry Randolph (Cassandra James) assured Drew Cain (Billy Miller) and Dr. Kim Nero (Tamara Braun) that the tumor would resume growing. She wanted to be honest, but she was glad to give Oscar a hint of positive news for a change. Of course, Joss could start to convince herself that Oscar’s getting a miracle. She may hope the tumor stays the same size and Oscar gets to stick around. Unfortunately, that’s just not going to happen. The tumor’s growth will soon get back on track and that’ll be the end of their extra time together. Josslyn could end up even more upset than before. We already got a glimpse of what Joss will be like when Oscar finally passes away. She was a mess after he had a seizure during their catacombs adventure. It’s clear that deep down, Josslyn hasn’t accepted this enough to lose Oscar yet. They’re trying to be normal and pretend everything’s fine, which is good in some ways and bad in others. It’s great that Oscar’s living his life the way he wants and make the most of his final days. Unfortunately, it’s also going to make it more difficult for Josslyn to let go. Terry warned that Oscar needed a plan for when his tumor gets larger. He should eventually get to the point where he can’t walk, talk or eat. Seeing Oscar like that will be traumatic, but Joss will really lose it once Oscar’s gone forever. Thanks to a reliable leak, we know Oscar indeed won’t make it. 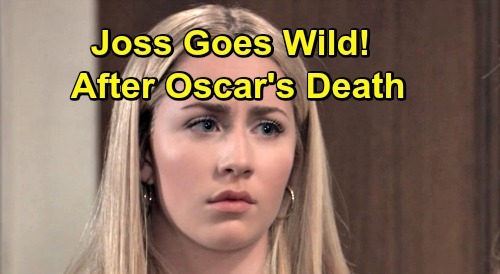 General Hospital spoilers say Josslyn will have a lot to deal with after Oscar’s gone. Her grief could really take a toll. Joss may become bitter and take a walk on the wild side. She’s always been a feisty teen anyway. Josslyn has proven that she turns to bad behavior when she’s in crisis mode. When Carly Corinthos (Laura Wright) was dealing with the trial and Ferncliff chaos, Joss ended up shoplifting. Naturally, Josslyn could do something even worse once she’s reeling from Oscar’s death. Cameron Webber (William Lipton) is normally just as bad about getting in legal trouble, but he may be the one to talk some sense into Joss. He may offer a shoulder to cry on and help her stop her destructive behavior. That’s certainly not what Oscar would want. He would much rather Josslyn be happy and find a way to move on without him. General Hospital spoilers say Cameron will convince Joss to do that sooner or later, but she’ll face tremendous heartache in the meantime. We’ll give you updates as other GH details emerge. Stick with the ABC soap and don’t forget to check CDL often for the latest General Hospital spoilers, updates and news.